Case Play time! When is a foul tip a foul ball? A catch an out? A dead ball alive? 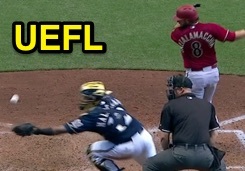 First year MiLB call-up umpire Ryan Blakney witnessed the case of the flying foul tip Sunday during the eighth inning of a tied D'Backs-Brewers game at Miller Park. With none out and none on, Diamondbacks batter Jarrod Saltalamacchia faced a 2-2 fastball from Brewers pitcher Jeremy Jeffress. With the 95-mph heater cruising over the heart of home plate, Saltalamacchia's swing made slight contact with the ball, propelling it directly toward BrewCrew catcher Martin Maldonado's glove. Replays indicate the ball deflected off Saltalamacchia's bat directly onto the top of Maldonado's glove, popping up into the air behind the right-handed batter's box where it was caught on the fly by the diving catcher and declared a foul tip by plate umpire Blakney. Case Play Question 2015-04: First, was Blakney's call correct? Was this a caught foul tip for strike three or was this a caught foul ball for an air out? This is an important distinction, for had there been a baserunner attempting to steal during this play, he may have been safe at second on a foul tip, but easily doubled up at first base on a caught foul or fly. Second, what would the call have been had the ball deflected not off Maldonado's glove, but his chest protector or helmet instead (and subsequently been caught on the fly in similar diving fashion) - out or safe? Were the broadcasters correct in their description? What rule(s) covers this? Case Play Answer 2015-04: 1) Yes, Blakney was correct and the batter was out on three strikes. Rule 5.09(a)(2) [OBR 2015 Rule 6.05(b)] specifies this play was a foul tip out (batter is out when "a third strike is legally caught by the catcher"). Rule 2.00 (Foul Tip) [OBR 2015 Definition of Foul Tip]: "A FOUL TIP is a batted ball that goes sharp and direct from the bat to the catcher’s hands and is legally caught. It is not a foul tip unless caught and any foul tip that is caught is a strike, and the ball is in play. It is not a catch if it is a rebound, unless the ball has first touched the catcher’s glove or hand." Replays indicate Maldonado's catch was a rebound that first touched F2's glove/hand, meaning this was a foul tip and the batter is out. 2) Had the ball first contacted Maldonado's equipment (e.g., so the sequence would be BAT=>CHEST PROTECTOR=>GLOVE as opposed to BAT=>GLOVE=>GLOVE), the proper ruling would be a foul ball. If first contact was glove or hand, the proper ruling would be foul tip, if caught (foul ball if dropped). The comment for Rule 5.09(a)(2) [6.05(b)] covers this: "If a foul tip first strikes the catcher’s glove and then goes on through and is caught by both hands against his body or protector, before the ball touches the ground, it is a strike, and if third strike, batter is out. If smothered against his body or protector, it is a catch provided the ball struck the catcher’s glove or hand first." Thanks to all participants in this discussion; two UEFL CP points are headed your way.